We have been successfully running our day camp and summer camp programs for more than two decades, creating an atmosphere and schedule of activities that promote personal growth and values the individual. Our team of dedicated, skilled coaches, college students and teachers provide plenty of mentoring and guidance to our campers, facilitating their involvement in a wide range of activities and events. Each camper has the opportunity to choose those activities that interest them the most, resulting in a camp experience that’s packed full of the pastimes they enjoy the most. Check back often for a number of exciting updates from BBL! Meet our Camp Director Ian Feibelman!…Learn about our outstanding summer camp program…Tour our wonderful facility and see Camp in session! Call us at 609.259.1777 or email fun@blackbearlake.com with any questions! Kids Activities and Fun Day Camp for Teens! 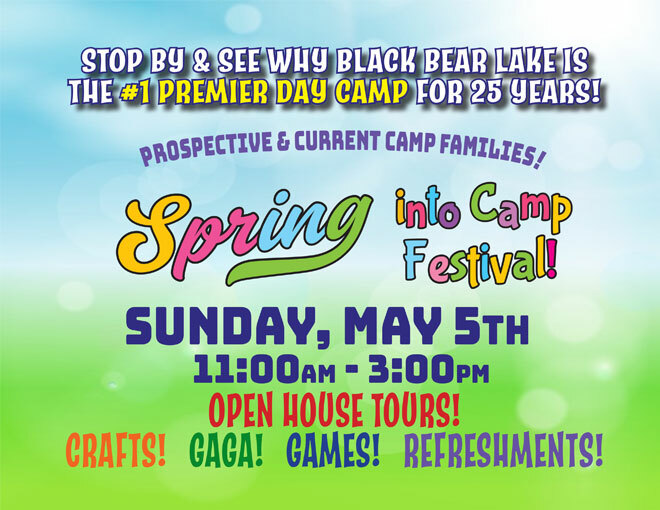 Black Bear Lake Day Camp is a special place for campers ages 3 to 15 years old! We treat every child as an individual and structure our camp so that each camper is able to develop and grow as a well-rounded individual during their time with us. With plenty of challenges and enjoyable experiences on offer, our camp is a great place to make friends, have fun and learn new skills. Please use this website to begin your exploration of everything BBL has to offer when it comes to children’s leisure and sporting opportunities. Contact us today so we can schedule a private tour for your family with one of our directors. If you would like to be mailed a brochure please CLICK HERE.